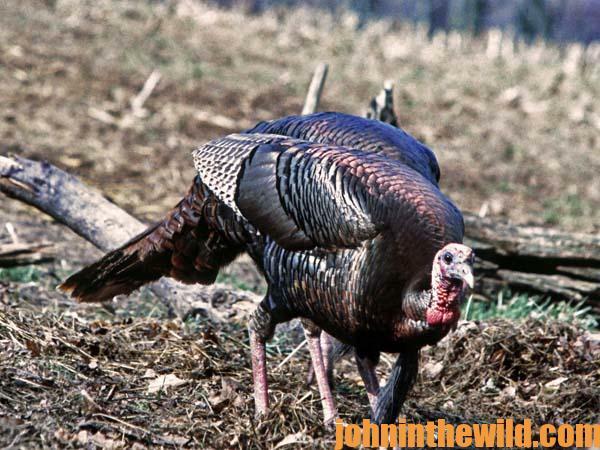 John’s Note: Not knowing the typical set-up for hunting turkeys is one of the problems that a novice hunter has. He attempts to get too close to the turkey, and the result is that the bird spots the hunter and moves-out of that region well before the hunter even tries to call to him. Most often this happens when a turkey gobbles in the direction of a hunter, turns-around on the limb, faces the opposite direction and gobbles away from the hunter. The bird then sounds farther away than he actually is. A good rule of thumb is to always set-up farther away from the bird than you think you should. There are times when a hunter must move or else he won’t get a gobbler. Maybe there’s a creek or a ditch of wh ich he’s not aware. Perhaps the gobbler has encountered some hens and started to walk-out of the area. 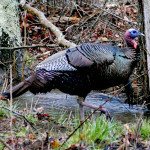 The turkey may be call-shy or just ornery, because of other hunter encounters. When you do move from spot to spot, change calls. Hopefully, the gobbler will think that there’s yet another hen that’s out looking for him. Sometimes, an aggressive hunter will change his position several times. But by moving, he often spooks the tom. 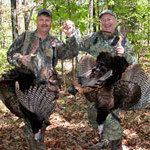 Experienced hunters say that patience bags more gobblers than running and gunning. One of the hardest turkeys to set-up on is the turkey that’s across a body of water. Turkeys generally don’t like to fly-across water to meet a hen, and most of the time they won’t. But if there’s a turkey gobbling on the other side of a creek that you can’t swim or refuse to wade, there are two techniques you can try. Start calling aggressively with cuts, cackles and excited yelping. Put some emotion in those calls. You want to make the gobbler think there’s a hen that’s so excited about breeding that she just can’t stand it. 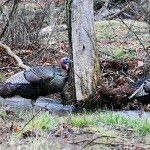 Frequently, a gobbler will become just as excited and drum and strut in hopes of getting the hen to fly across the creek to him. Once you’ve got the turkey fired-up and know he can’t see you, start calling and moving away from the edge of the riverbank to create a picture in the gobbler’s mind of a hen that’s ready and wanting to breed. But since the tom won’t fly across the creek to meet her, she’s walking off and locating a gobble on her side of the water. 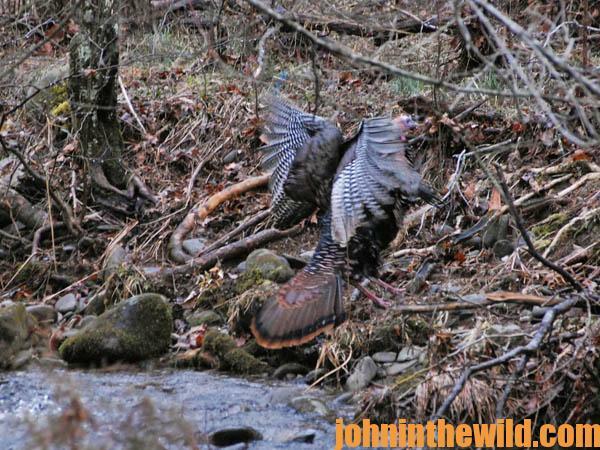 Hopefully, the gobbler won’t be able to stand the pressure of the hen walking away and will fly across the creek. 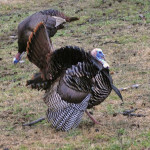 Be sure to listen for the gobbler’s beating wings, because sometimes a longbeard will fly right to the caller. Imitate a one-man band, cutting and cackling with a diaphragm call, while yelping and cutting on a box call, if a turkey’s hung-up across water. You must paint a picture in that gobbler’s mind of a harem of hens that are excited and ready to breed. Then change calls, and sound like a whole flock of hens, each with a different voice and excited about mating. 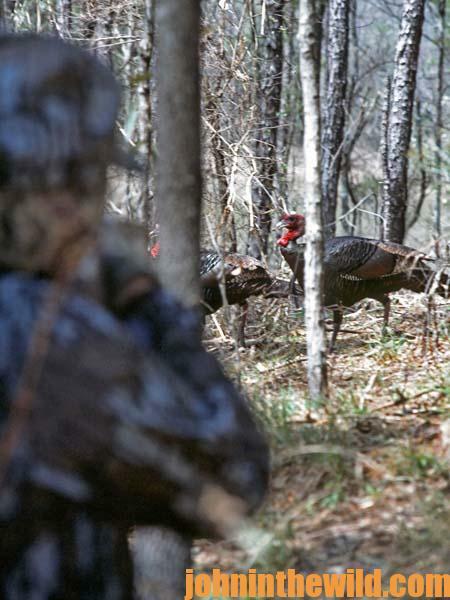 Often, a gobbler that hears that much hen talk on the other side of a creek just can’t stand the pressure. 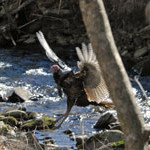 He believes that some gobbler will breed those hens in a short time, and that it may just as well be himself, even if he has to fly across the creek for the date. The gobbler strutting in the field is often the easiest turkey to find but can be the most-difficult bird to set up on and call. Usually when a tom’s out in the field, he either has hens with him or is in a place where hens should come. The natural order of things is that when a hen sees a gobbler, she should go to him. There are three ways to set-up and take this type of tom. A daylight field gobbler is a tom that flies from the roost at daylight, remains in a field all day long and then flies back to the roost at dark. He’s a difficult bird to kill. However, if the hunter reaches the field before daylight and takes a stand 10-15 yards in the woods off the edge of the field, he can confuse a gobbler and make him come to his call. 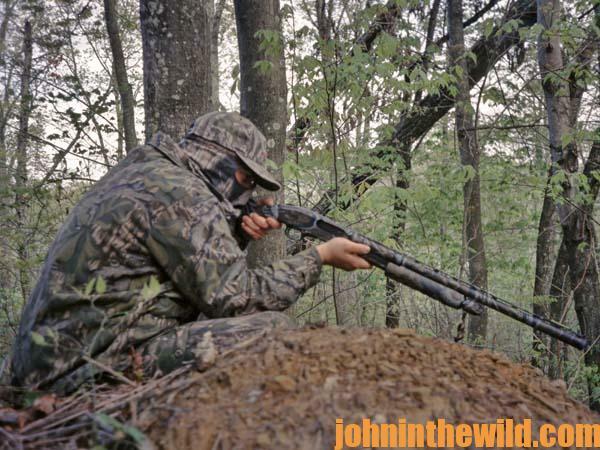 Once the hunter has taken a stand, he can begin to call to the gobbler before daylight and before the tom has started gobbling or any-other hens have awakened. The hunter should begin his calling just as light is beginning to glow in the east. When the bird wakes-up and hears a hen calling to him from the field before fly-down time, he wonders if there’s a new hen moving into his area. He’ll often fly-down from the roost to meet her before the other hens wake-up. 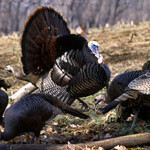 Hens will leave a gobbler by 10:00 am to return to their nests, especially late in the season, which leaves the gobbler all alone in the field. If the hunter takes a stand 30-40 yards off the field and begins calling and using light yelps, clucks and purrs, he can get the gobbler’s attention and make the tom believe there’s one hen left to breed before the day’s over. The hunter may have a chance to take a subordinate bird, if there are three or four gobblers in a field with a group of hens. Remember that since the boss gobbler claims the right to breed the hens, subordinate toms may not have had an opportunity to breed any of the hens in the field. Therefore, if you set-up fairly close to one of these subordinate gobblers that’s not strutting, you may be able to call him to your blind.